Don Krim is being hailed for his unique voice and singing in the countertenor sphere. He currently divides his time between Hollywood, California and Mallorca, Spain. In Los Angeles Don performs regularly with his accompanist Eric Kinsley and members of Musica Angelica and LA Baroque Orchestra. In Spain credits include: Pergolesi’s Stabat Mater with Camerata Sa Nostra; Carmina Burana with the Capilla Mallorquina; Handel’s Ode to the Birthday of Queen Anne with Maestro José María Moreno; Don was invited by celbrated harsichordist Tim Roberts and Bernat Cabot to sing Handel, Bach and Vivaldi at the International Festival of Music, Bunyola with Ars Musicae. Don performs regularly with pianist Suzanne Bradbury, and has premiered in Spain and the United States individual compositions written for him by British, award-winning composer Michael Alan Watts. The composer has also tailored a leading new operatic role for him to a play by Federico García Lorca. I am no longer of this world is Don´s debut CD. "I am no longer of this world" Reviewed by RadioIndy.com! 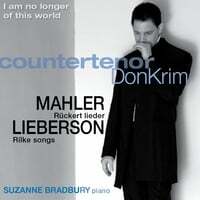 Don Krim's classical operatic album is titled "I am no longer of this world." This is the countertenor's debut album, featuring Suzanne Bradbury on the piano, in which he sings Gustav Mahler's "Ruckert Lieder" and Peter Lieberson's "Rilke Songs." Krim’s voice is breathtaking and while it may remind one of a mature choir-boy or a mezzo-soprano, it actually is neither and superior at the same time. "Atmen, du unsichtbares, Gedicht!" is a song in which we can hear how his voice can lie in such a high register, yet also resonate deeply, in this song that embodies both dark and bright themes simultaneously. In "Ich bin der Welt abhanden gekommen" one can really hear the beauty within Suzanna Bradbury's finesse upon the piano and it interplays with Don's soaring voice. This is an album that any fan of classical vocal composition would enjoy. If you already enjoy the likes of Lorraine Hunt Lieberson then "I am no longer of this world" is an album you will want to hear immediately.